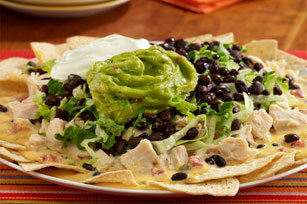 Loaded nacho recipe tops tortilla chips with queso dip, lettuce, chicken and black beans for hearty fare. Combine undrained tomatoes and Velveeta in large microwave-safe bowl; cover. Microwave on HIGH 3 minutes or until Velveeta melts, stirring after 2 minutes. Remove from microwave; stir until mixture is blended. Meanwhile, heat medium nonstick skillet over medium-high heat. Add chicken; heat 2 to 3 minutes or until hot, stirring occasionally. Arrange tortilla chips on large platter. Pour tomato mixture over chips; top evenly with chicken, lettuce and beans. Spoon on dollops of sour cream and guacamole.